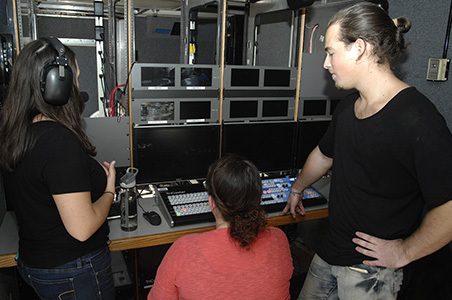 In the new production truck are, from left, Karen Bortolus, director, Kristin Parodi, technical director, and Jesse Kinnamon, director of photography. In the kitchen with Chef Doug Fee are Fendi Oliva Reynoso, camera operator and Karen Bortolus, director. 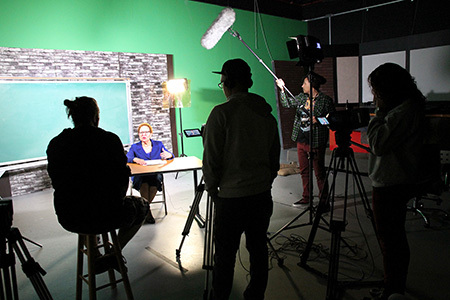 Students interview Dr. Diane Campbell, Executive Dean for Student Services, in the MCCC Television Studio. Campbell played a key role in the development of online learning at Mercer. The MercerOnline student production team, from left, David Breece, Aldo Battle, Robert Myles, Erick Rosado, Stephanie Velez, Emily Kapolka, and Josue Lora. 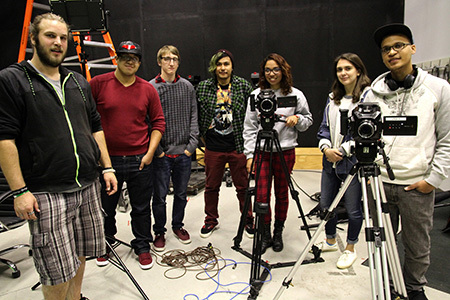 West Windsor, N.J. – Television and Digital Film students in the Applied Field Production course at Mercer County Community College (MCCC) are getting deeper into their field and taking the show on the road. Thanks to funding from Dow Jones, a production truck that was donated to the college by PVI Virtual Media Services has been fully equipped for prime time. It features a multicamera high definition fiber system complete with live video switcher, graphics software, two-channel instant replay computer, and 16-channel audio mixer. According to TV faculty member Steve Voorhees, this new technology is giving students the real world, hands-on experience of completing assignments from a mobile unit. 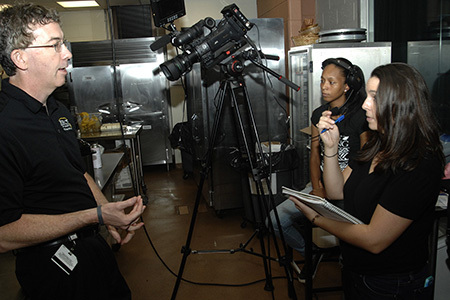 Currently, students are producing and directing five 30-minute episodes of “Dish It Out” with MCCC faculty chefs Doug Fee and Frank Benowitz in the college's Culinary Center. Now in its 10th season, the show features the two chefs preparing dishes in a format similar to network cooking shows. The “Dish It Out” students haven’t stopped there. They are also managing the show's social media presence on Facebook, Twitter, Instagram, YouTube, and WordPress. In October they produced a video of a Culinary Tasting Benefit event hosted by the Hotel, Restaurant and Institution Management program that drew restaurants and community members from around the region. A second group of students has focused its efforts on an especially innovative aspect of Mercer’s history as the college celebrates its 50th anniversary this year. The students are researching and filming a video that traces the roots and significant growth of online learning at MCCC, interviewing professors and administrators who have played key roles in developing what is now known as MercerOnline. They are interweaving still photos and other artifacts from the college’s archives into the video. Voorhees observes that the Applied Field Production course operates like a business, with each student earning a job for a client project that lasts approximately 10 weeks.